Above: Date:7-1-05 Between lines [A] you have wood that formed the previous year. Between lines [B] is the current growth increment (This years material.). 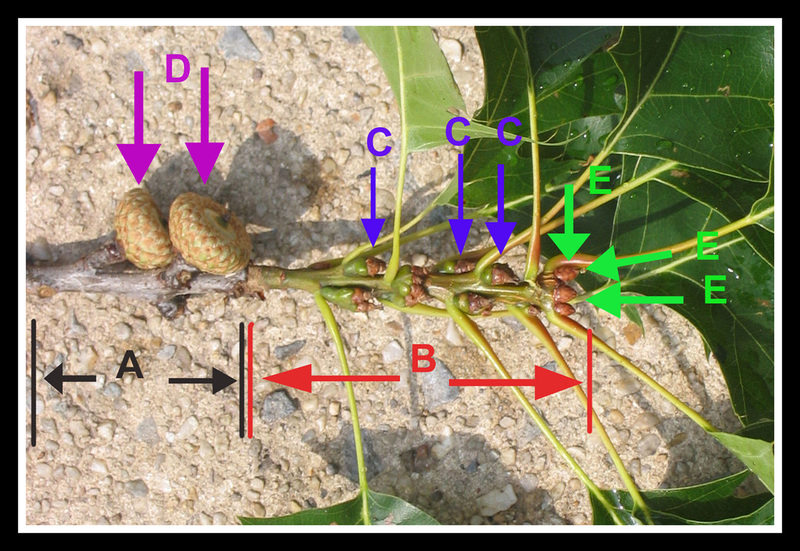 Point: this tree has its babies the year before [C] and then they mature on the previous years wood [D], the following year. [C] = New born young acorns. They will not form or mature until next year. [D] = Acorns maturing on last years wood. They we born last year. [E] = The newly forming buds for next year. On white oaks, the acorns are born and mature the same year on the current growth increment (for example click here). Below is a close up of the above sample. Can you see the difference between young acorns and buds?